“Man, I don’t want to look like the guy who killed the Roots,” Jay-Z once said to Ahmir “Questlove” Thompson, the group’s drummer and de facto spokesman. The Roots had cut ties with its label Interscope. The band wanted to move to Def Jam for a few reasons, including one very excellent one: Jay-Z was president. He and the Roots claimed born-and-bred East Coast roots, and the band backed Jay-Z during an MTV Unplugged album. But where the Roots saw similarities, Jay-Z couldn’t help but notice differences. “Make an art record,” he said. After all, the Roots stood out as a hip-hop group—as in odd-man out. In 2006, the Philadelphia hip-hop band released its art record: Game Theory. It examined subjects like the aftermath of Hurricane Katrina and Philly’s rising homicide rate. In 2009, Jimmy Fallon asked the Roots to be his late-night band. Quick segments like “Freestylin’ with the Roots”—any genre fair game—and a nightly walk-on song for each guest displayed the band’s vast musical knowledge. Like Jay-Z at Def Jam, critics stood back, initially dubious. But under Fallon’s bright stage lights, the Roots thrived. Questlove’s new memoir, Mo’ Meta Blues, arrives as the Roots prep a 14th LP and collaborative album with Elvis Costello. The book debuts at a weird moment for chroniclers of hip hop. Your average Barnes & Noble only provides a few books about the genre: Tupac’s The Rose That Grew From Concrete; RZA’s The Wu-Tang Manual; Jay-Z’s Decoded among them. The majority of popular culture magazines—including Ozone, Mass Appeal and VIBE—have devolved to modest blogs, just as the still-young genre begins to dominate the mainstream. By default, Mo’ Meta Blues offers a vital, non-mainstream chronicle of hip-hop history. Throughout, Questlove seems supremely self-aware of the importance of this task. He begins with an interview with himself. In it, he tries to figure out how to write his memoir. “This book should be different. I don’t want it to be your average book,” he writes. (“What does that mean?” “I don’t know yet.”) He recognizes that he hears music differently too, bypassing vocals at the forefront and fixating instead on smaller movements: a hi-hat here, a rhythm there, atmosphere in which his mind can wander. Maybe it’s because he inherited hand-me-down records from his sister, mother and yacht rock-loving father, like James Brown’s sprawling The Payback. By “your average book,” the somewhat sheepish Questlove refers to the standard music memoir, these self-assured accounts littered with shark stories. We learn here Questlove discovered music like most people: at home, courtesy of the parents. One of his earliest memories of drums—his bam! moment—came at Christmas 1973, around age two, with Donny Hathaway’s self-titled album playing. In other memoirs, this sort of event arrives “predictable and oversimplified” to Questlove. Nevertheless, it arrives, and it’s important. Questlove cannot help remembering it, and he shouldn’t. In fact, many of Mo’ Meta Blues’ most entertaining moments surface when the author writes, as a fan, of iconic songs and musicians. He recalls the time he saw Prince roller-skate. Meeting Prince reminded him of when, at age 8 and on tour with his family’s doo-wop quintet, Lee Andrews & the Hearts, he ran into KISS at a Buffalo, N.Y. hotel. (“I was excited and terrified and generally overloaded, so I let out the most high-pitched, bloodcurdling scream you can imagine.”) He dissects A Tribe Called Quest’s song “What”—the samples, Q-Tip’s questions as lyrics, its four-second pause—as if in awe. Questlove packs his memoir with these kinds of encounters. Comedian Tracy Morgan once invited the band and 14 girls to a toe-licking contest. (Questlove, then in a serious relationship, bolted from the hotel room.) Between such encounters, he talks of moving from Geffen to Interscope, monitoring radio airplay, tracking Metacritic scores like baseball stats. Readers can imagine how grueling it felt to tour for decades, as the Roots did, simply by wading through all the opinions here, especially as the Roots’ main inspirations (Slum Village, De La Soul, Tribe) lost relevance and began to disappear. No matter how strange, the story remains the same: The Roots, and especially Questlove, always stayed the odd men out. In an interview with SPIN, Questlove sounded concerned that his story, and by extension the Roots’ story, might not be worth telling. It isn’t. 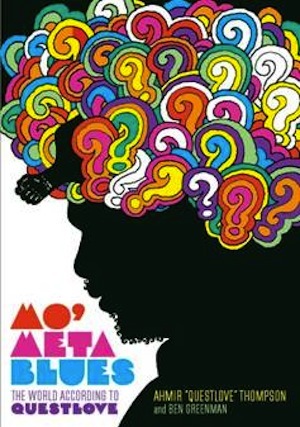 In fact, the more Mo’ Meta Blues questions Questlove’s own relevance, the more valuable it feels. Mo’ Meta Blues confirms this, but through a common story, one we all find relatable: Whether we like it or not, we’re looking for answers, but finding none. Christina Lee is a freelance arts and culture writer based in Atlanta. She is a contributing writer to eMusic, MTV Hive and Creative Loafing, and she has also written for KoreAm and the BBC.